We wanted to make sure and remind you that it’s time to give a little TLC to the HVAC system that worked so very hard for you through yet another hot and humid Florida summer. Lets face it—it is still hot out there and probably will continue so for a while yet. 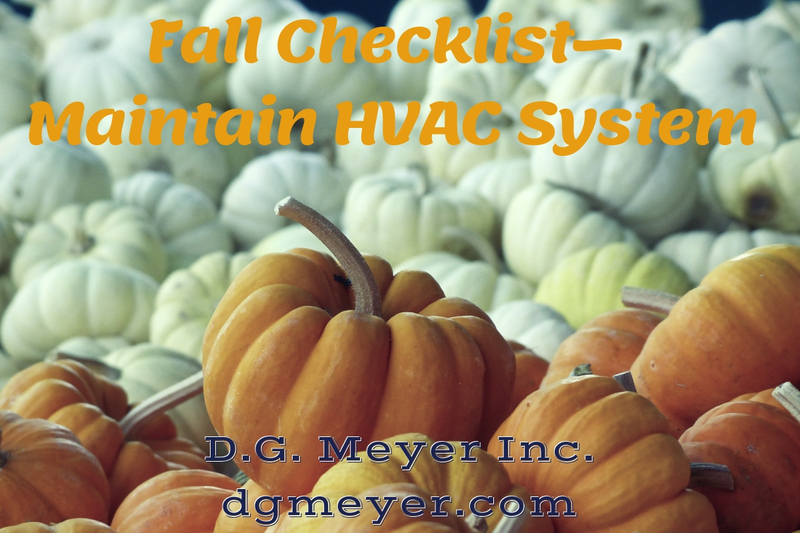 However, with the change of season officially recognized now, it’s the perfect time to take stock of your System’s recent performance. While it still may be hard to believe that Fall is here, you should take the initiative now to be certain that you are prepared when cooler weather arrives in Central Florida. Be sure your unit is in tip-top condition before the Heating Season begins. This is also a great time to consider the replacement of old or less than efficient equipment. Our Residential Sales Department Team would be pleased to give you an estimate or answer your questions. For maintenance and service, call D.G. Meyer, Inc. and ask about our Residential Energy Saving Agreement. Let us provide your A/C system with a complete precision tune-up and a professional semi-annual check, to be sure that you are getting the most from your energy dollars. Call us at (386) 253-7774 or Contact Us to make an appointment or for more information.